When Emira came to stay with me we ended up confessing a deep, dark secret each of us carried; we loved the movie Marie Antoinette. Not liked, not thought was just nice, but loved. We even shared a favourite scene (the birthday at the lake at sunrise when they’re all just sitting there). We both loved how human this movie was which you don’t often see in a period piece nor in an autobiography such an infamous person. We both were in amazement at how perfect Kirsten Dunst, an American, was for this role and could picture no one else in it. The story told resonated with us deeply. This movie was the only thing that had me interested in finally visiting Versailles after dozens and dozens of trips to Paris and had Emira put in on her places to go. However, what really made us swoon was the beauty, the frivolity of the set, and the clothing. The song, “I want Candy” is so perfect for one scene in particular because this movie was eye candy. Regardless of how you feel about the story line (it seems to be either a hit or miss with people), the one thing you can’t get away from is how beautiful, exciting and over-the-top inspiring it is to watch. As times are challenging for so many of us and practicality seems to win over frivolity, it’s nice to escape into a movie that can transport one into a different place and inspire a little decadence. Everyone can use a little of that – I know I can. This lead me to take cue from Emira who told me that when she watches the movie, she buys a little bottle of champagne, pours it into a beautiful glass and sits and watches the movie in a completely in-love state. So last night, I did the same, breaking out my never used crystal champagne flutes, poured some lovely sweet dessert wine, put on my best dress, lit my favourite candle and popped in the CD. Decadence without fortune. Simple pleasures without effort. Joy without guilt. It reminded me that although one might not live in Versailles, have Manolo’s or pink macaroons at her constant disposal, there are ways to feel luxurious no matter what the times or the bank account says. Delurking to say that I love this movie too. Such a beautiful movie. I love how they blended modern things into it as well- watch for the scene where you can see a pair of Converse shoes. 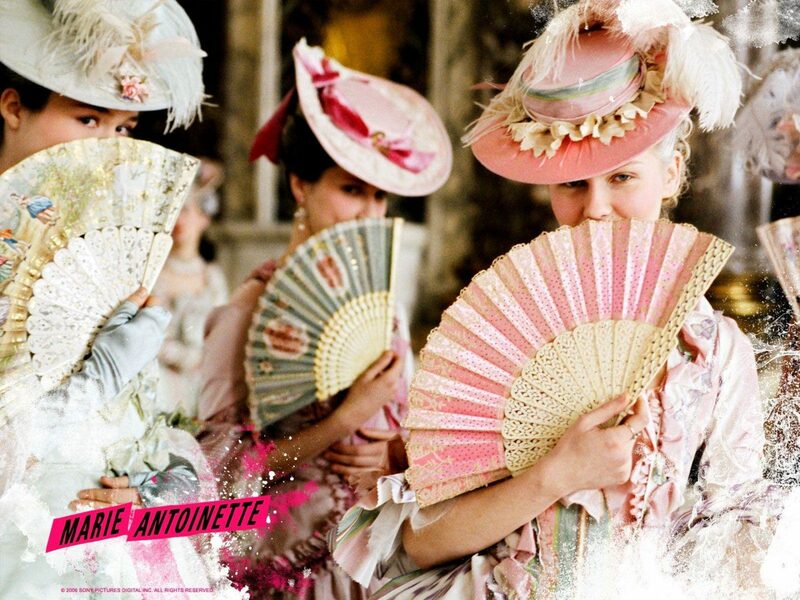 You might like the book that this movie was based on- Marie Antoinette The Journey, by Antonia Fraser. This is one of those polarizing movies – you either love it or don’t get it. I loved it. I still listen to the soundtrack all. the. time. I love the scenes in the Hamlet with the little girl. So quiet and beautiful. When I went to visit the Hamlet it rained… but it was still gorgeous! Since you loved the movie, you must read (if you get a chance) Abundance, a novel of Marie Antoinette…its a large book but I did not put it down for three days. It won’t disappoint! I love the movie too – and next time I watch it I will definitely be sipping champagne in a crystal flute!